At Second Life banjo Every banjo is guaranteed and will be repair at no charge if defective. Shipping is included in the price for Canada and continental United States. The $120,00 budget for shipping will be refunded if the banjo is picked up at the shop. Delivery time is usually 4 days after payment unless some modification are required by the buyer. Hard Shell case are included for most banjos. If you do not require a hard shell case the $150,00 budget for the case will also be refunded. Please read the banjo description to make sure that the case is included. Railroad spikes ( fifth string capo) are installed for free. Every banjo is professionally set up and is ready for playing. All components have been put together with the most care and accuracy. PLEASE TAKE NOTE: The restored vintage banjos for sale have small bruises or scratches. None of those will affect the banjo solidity or sound. Because some components are close to 100 years old, every part of those instruments have been carefully inspected, cleaned, polished and repaired when needed. Old Time thin rim no. 10 of 10. Large rim. SOLD , This banjo is not available for sale. Now. it is going to play music... This is no. 8 of 10 of that serie. 3 1/4 inches deep one ply hard maple thin rim with a raw brass Dobson tone ring. 11 inches head, Handmade raw brass hardware parts, Arcand ''Sound opener'' tailpiece. Raw brass Gotoh tuners. Black walnut one piece neck, Ebony fingerboard and headstock veneers. double action truss rod. 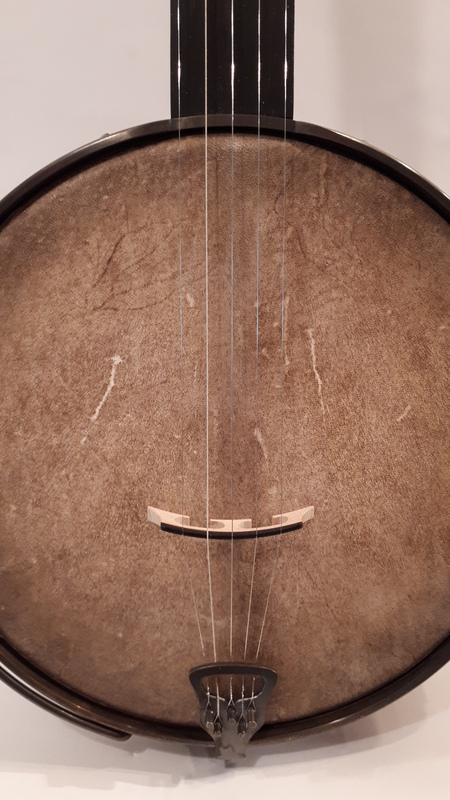 Goatskin, Nylgut or steel strings. Deep old time sound, A lot of volume and a great voice, this banjo wont let you down in a jams. Plays like a cloud. Built to last centuries. 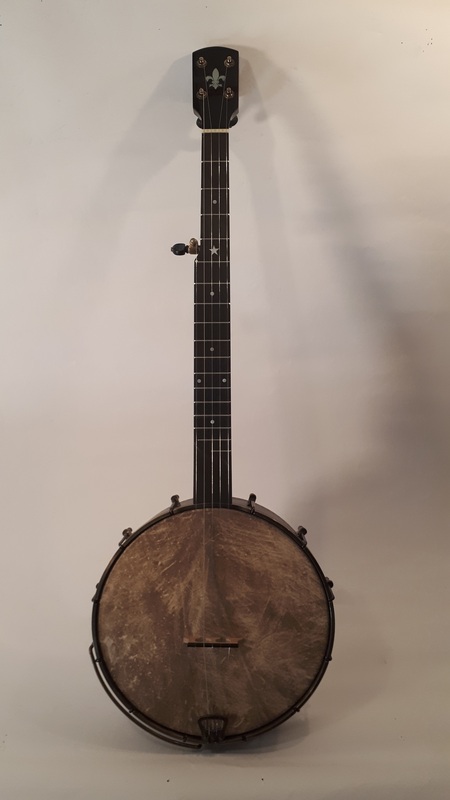 Hardshell case included.. Plated Second Life Banjo/ Carl Arcand no.1299-4 and ready to play. This banjo was build using a vintage maple with brass spunover rim, new hardware and new neck. 10 5/8 inches in diameter and 2 7/16 inches deep hard maple rim with a thick 1/24 of an inch brass spinned spunover. New bracket shoes, hooks and hook nuts from Bill Rickard. Hand made tension hoop. Natural Goatskin head from Jamaican goat. 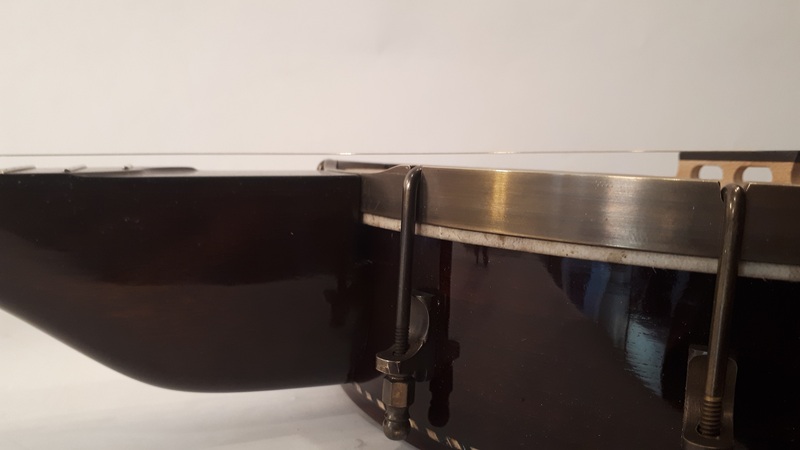 Brass wire armrest and No knot tailpiece. 5 years old shop dried Black walnut one piece neck with Ebony fingerboard, headstock veneer and back plate. 1 3/8 inch wide at the nut and 2 inches at the heel, hidden 2 way truss rod, Mother of pearl dots and inlay. Gotoh brass tuners. Stained maple 3/4 inch bridge. A great old time sounding banjo with just enough sustain and a sweet voice. Shipped with a Boulder Alpine Gig bag or a Superior hardshell case. 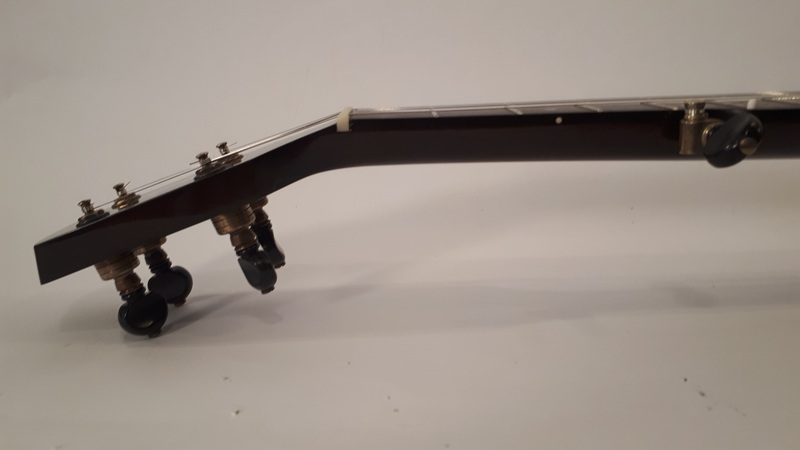 Build to last a century and plated second Life Banjo / Carl Arcand No.1296-4 If you need railroad spikes for capo on the fifth strings please let me know when you purchase the banjo. it's free.. 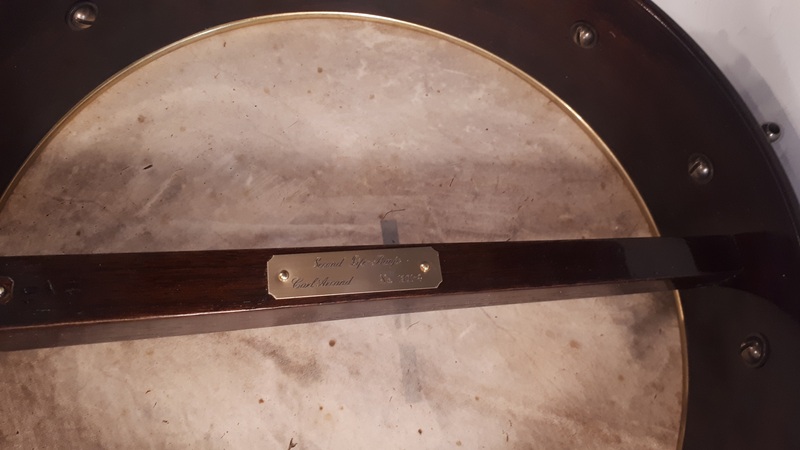 There is no marking on this banjo except for a serial number 592 on top of the dowel stick opening on the rim. The Peghead profile is from George Matthews and the serial number from late 1800. Very good quality and heavy Nickel plated brass spunover rim. 11 inches in diameter. The palting is in excellent condition and the 30 bracket shoes are original. I installed a new nickel plated brass tension hoop with new hooks and hook nuts. A new Fiberskin head and a new bridge. The black walnut neck is straight and in very good condition with the original frets. The neck is 27 1/4 inches scale. The Ivoroid pegs are original and work fine. 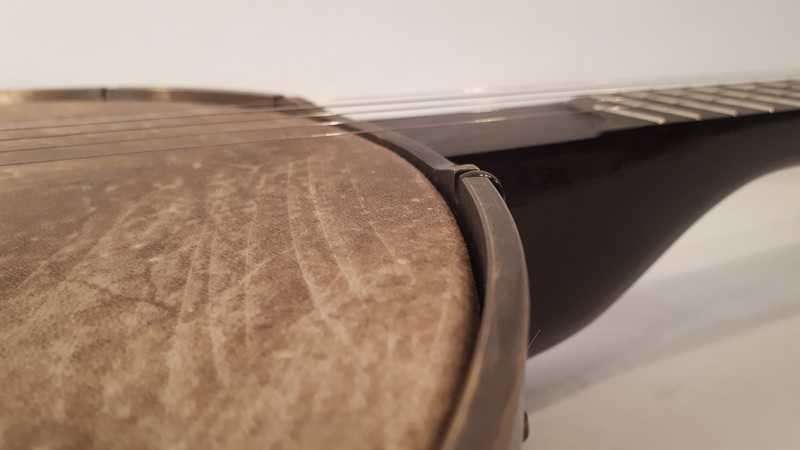 Strung with Labella nylon banjo string, This vintage banjo has a great old time plunky sound with a lot of volume. Shipping and hardshell case included. 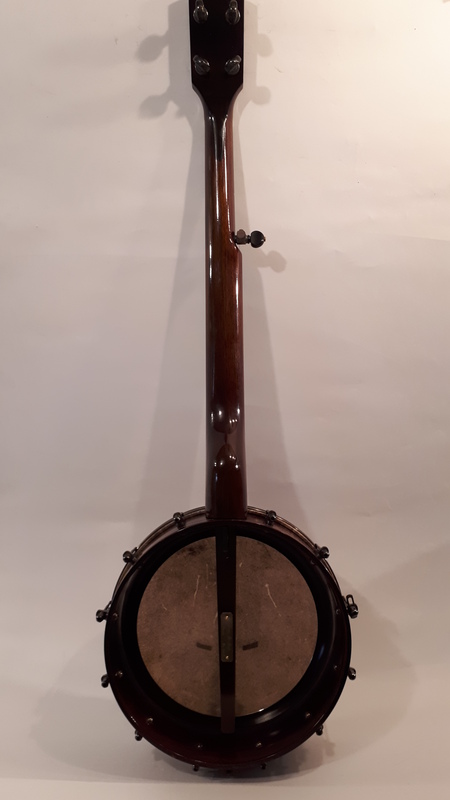 ( Picked up at the shop and without the hardshell case reduces the price to $780,00) Plated Second Life Banjo No.1295-4 and ready for another century of music. This is no. 3 out of a serie of 10 minstrel banjos I have planned to build during the next 2 years. Every banjo has something unique. Great for old time music and clawhammer style. 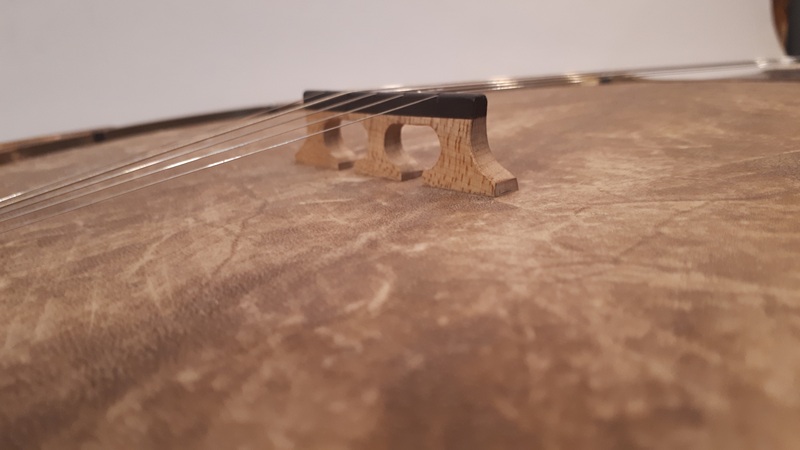 Presently strung with minstrel nylgut strings for low tuning, this banjo can be strung with classic banjo nylon or nylgut strings for standard tunings like double C or sawmill tuning. Please let me know the strings type and tuning you prefer and the banjo will prepared accordingly before shipping at no charge. One ply hard maple rim 12 inches in diameter. Sugar spalted maple neck harverted 5 years ago and air dried in my shop. 26 1/4 inches scale. 1 1/2 inch at the nut and 2 1/4 inches at the heel. Very comfortable neck. Bone nuts. Ebony pegs. Nylgut strings. Handmade bracket shoes and tension hoop. All raw brass hardware. Ebony tailpiece. Goatskin head. Nylgut Minstrel banjo strings. Plated Second life banjo / Carl Arcand No.1289-4 and ready for a century of music. SOLD. To order no. 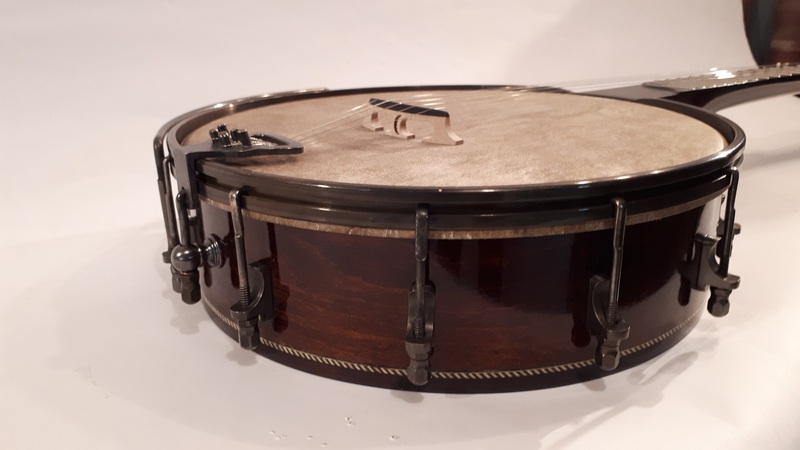 9 of that serie please go to the''New-banjos,model and prices'' page Old time thin rim banjo This is no.5/10 of that serie. 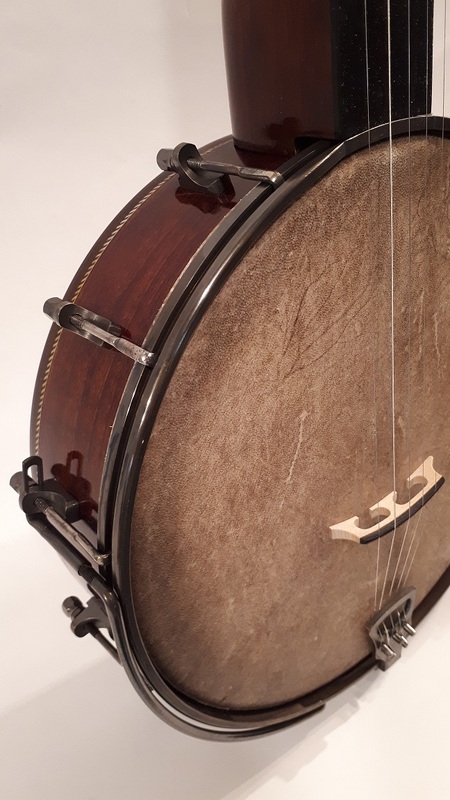 3 1/4 inches deep one ply hard maple thin rim with a brass round rod ring.11 inches head, Handmade raw brass hardware parts, Arcand ''Sound opener'' tailpiece. Raw brass Gotoh tuners. Black walnut one piece neck, Ebony fingerboard and headstock veneers. double action truss rod. Calfskin, Medium gauge steel strings. Deep old time sound, A lot of volume and a great voice,perfect for jams. plays like a cloud, built to last centuries. 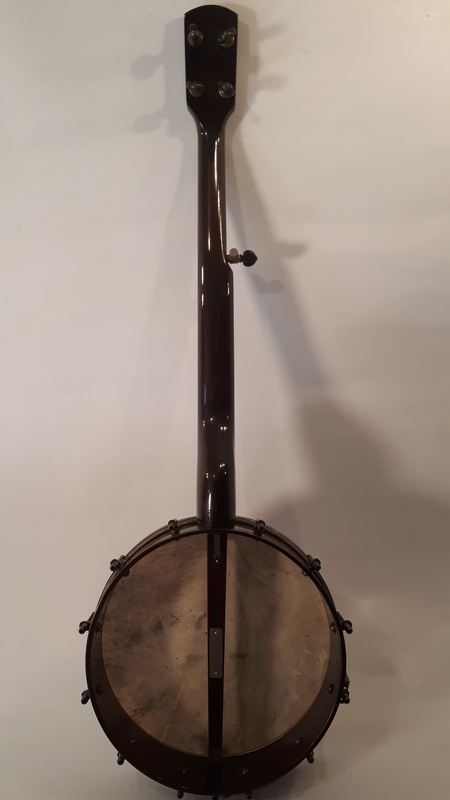 Hardshell case included.. Plated Second Life Banjo/ Carl Arcand no.1291-4 ready to play. SOLD. Beautiful solid late 1800's Victor Dobson spunover rim with a new black walnut neck. 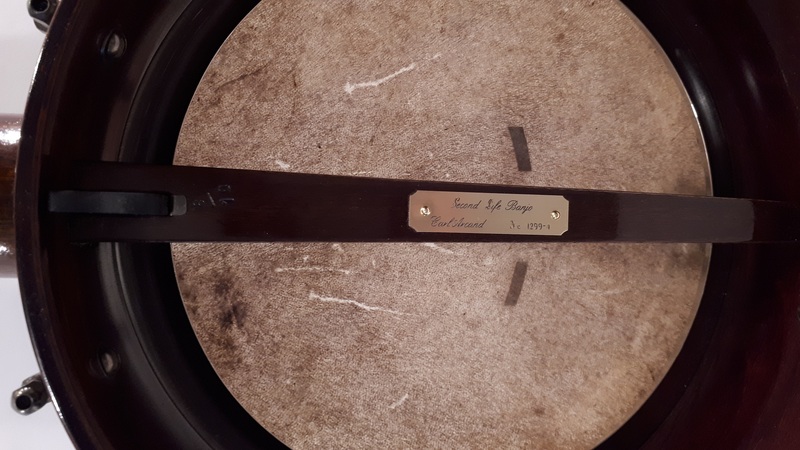 11 inches hard maple 1/4 inch thick rim from 120 years ago rim with a Rickard's Dobson tone ring. The rim is round, solid , with a thick nickel plated brass spunover. The bracket shoes, hooks and tension nuts are also fabricated by Bill Rickard. New black walnut neck and dowel stick from a billet that was air dry in my shop for 5 years after aging 2 years in a shed. Neck is 1 3/8 inch wide at the nut and 2 inches at the heel. Ebony fingerboard and headstock veneers. 2 way adjustable truss rod accessible by the back of the neck. Grover tuners and Gotoh fifth string tuner. Goatskin head mounted on a brass hoop. 3/4 inch bridge, set for clawhammer. Nylgut or steel strings. Your choice and no extra cost. Nickel plated brass no knot tailpiece and wire armrest. Plated Second Life Banjo no 1280-4 and ready for another century of music. 11 inches diameter by 9/16 inch thick and 3 inches total deepness. hard rock maple rim with Ebony cap and wood bindings. Nickel plated brass Tubaphone tone ring made by Bill Rickard. All nickel plated brass hardware. Hard rock figure maple one pieces neck with ebony fingerboard and heel cap. Mother of pearl inlays, neck widths are 1 3/8 inch at the nut and 2 inches at the heel. Neck scale is 25 1/2 inches. 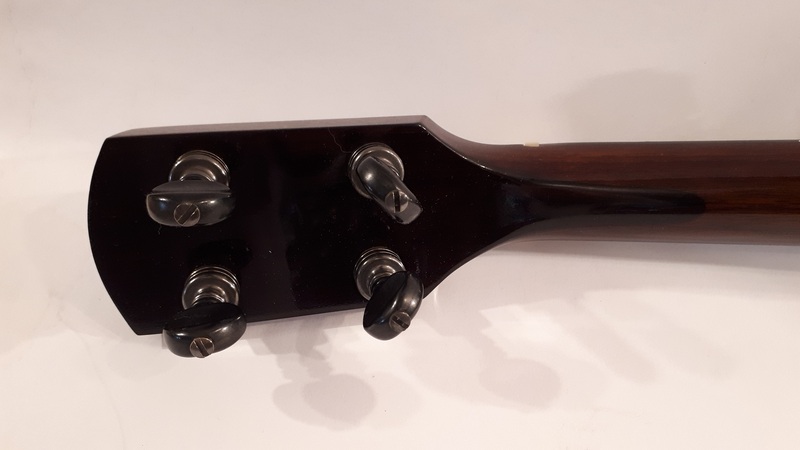 Gotoh tuners and Gotoh fifth string tuners. 5/8 inch heavy gauge Moon bridge by Randy Stockwell. Nickel plated brass Kershner adjustable tail piece. Strung with medium gauge steel strings. Plated Second Life Banjo / Carl Arcand no.1282-4 ready for a century of music. This new banjo was build to deliver the warm mahogany tone combine with the cast bronze tone ring sound. The hard maple rim was turned to fit a rare cast nickel plated bronze one piece flange and a Rick Kulesh prototype 20 hole tone ring. Mahogany resonator blank made by Jimmy Cox. Hand made mahogany one piece neck, Double action truss rod. 1 1/4 inch at the nut and 1 7/8 inche at the heel . The neck is very comfortable. Ebony fingerboard and head stock veneer. Ivoroid bindings and maple headstock binding contour. Deep and powerful this unique bluegrass banjo will not let you down. TKL hard shell case included. 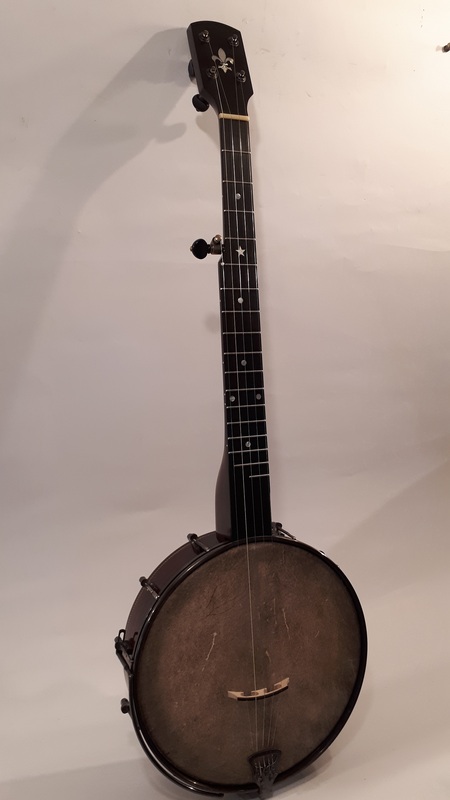 1921 Orpheum No.2 serial No.14151 short scale 5 strings banjo. 1921 Orpheum No.2 Ruttberg and Lange banjo.Serial number 14151. Beautiful 12 1/4 inches in diameter hard maple 5/8 of an inch thick rim with a one piece maple cap and a very nice cap binding. The pot assembly is all original with large close end ball hook nuts. 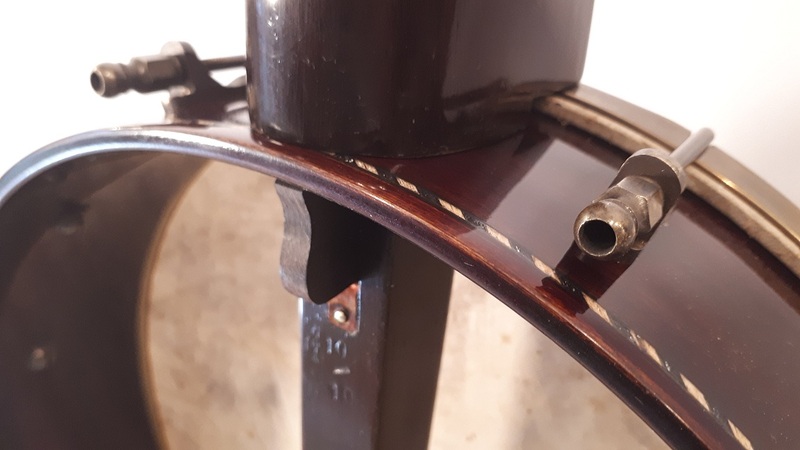 The bracket shoes and bolts, the tension hoop and the tone ring still have the original plating is very good condition. The nickel plated hooks are new. The wood rim has been cleaned and lightly refinished with tru-oil. The 24 5/8 inches scale ebony fingerboard and headstock veneer are mounted on a hard rock north America sugar maplewood neck laminated with ebony, maple and bloodwood. 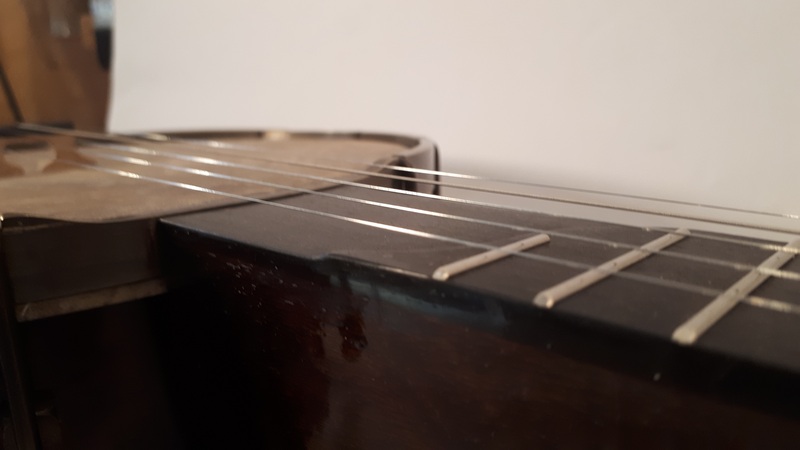 A double action truss rod is installed in the neck to prevent neck bow or twist. The hand cut MOP inlays have the same patterns as the original tenor neck. The set up includes a calfskin, a 5/8 moon bridge, a Presto or Kerschner tailpiece (at your choice), Gotoh tuners, medium gauge strings, bone nut,nickel / silver frets. Neck dimensions are 1 5/16 inch width at the nut and 1 15/16 inch at the last fret. the thickness of the total neck is 7/8 inch from first to sixteen fret. Strings action is set at 2,2 mm at the last fret. The banjo can be tunes in open G and in the key of A without capoing the neck. The sound is rich and deep in open G tuning, clean with a lot of voice when tuned in the key of A. The original untouched tenor neck is included. It's complete with all the inlays. Would benefit a frets job and the repair of small chip of ebony on the headstock veneer. A Superior hard shell bump case is included. 5 days shipping with Canada Post and USPS is included for United states of America and Canada. Plated Second Life Banjo No. 1252-4 and ready for another century of music. Restored raw brass spunover hard maple rim from late 1800 in excellent condition. A few small bruises are souvenirs from over a century of playing. New black walnut one piece neck with a 14 inches radius fingerboard. Hidden adjustable truss rod. Dots are set for 26 1/4 inches scale. Neck width at the nut is 1 3/8 inch and 2 inches at the heel. Bone nuts. Abalone fleur de lis inlay and dots. Natural calfskin mounted on a square brass hoop. The original tension hoop has been modified to accept round hooks. New raw brass tension shoes, and hooks. Original hook nuts. Gotoh raw brass tuning machine. 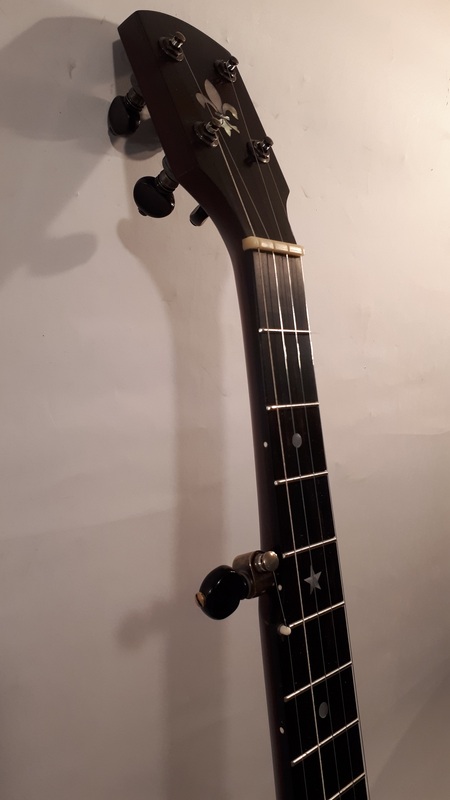 Hand made Ebony tailpiece with a abalone star. Presently strung with nylgut strings but can accept steel strings. Plated Second Life Banjo no. 1238-4 and ready for another century of playing. Superior hard shell case included. 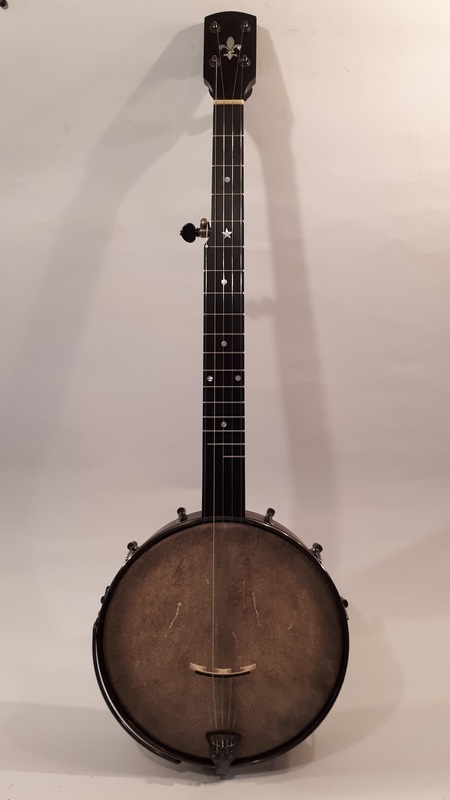 This is a very high quality and in very good condition classic banjo from early 1900. The 11 inches diameter heavy rim is made of 1/2 inch thick walnut with a nice profile and a heavy gauge nickel plated brass spunover. The large bracket shoes are nickel plated with some plating wear so the raw brass is showing on some of them. The hoop and the tension nuts, bolts, brass hooks and hook nuts are all original and plated brass with some wear so you can see the brass underneath in some areas. One shoe bolt is a replacement. 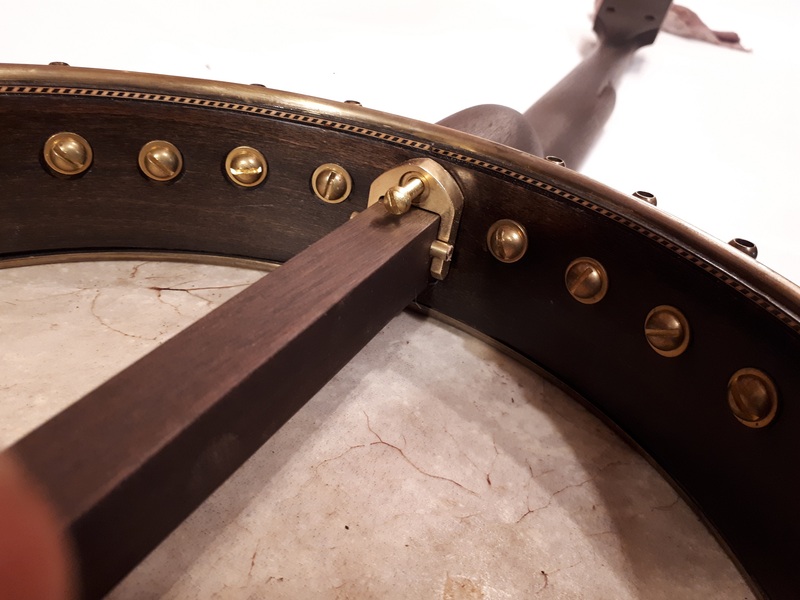 The original brass tension hoop and tailpiece have been recently re plated with nickel. The one piece walnut neck with maple lamination is perfectly straight. 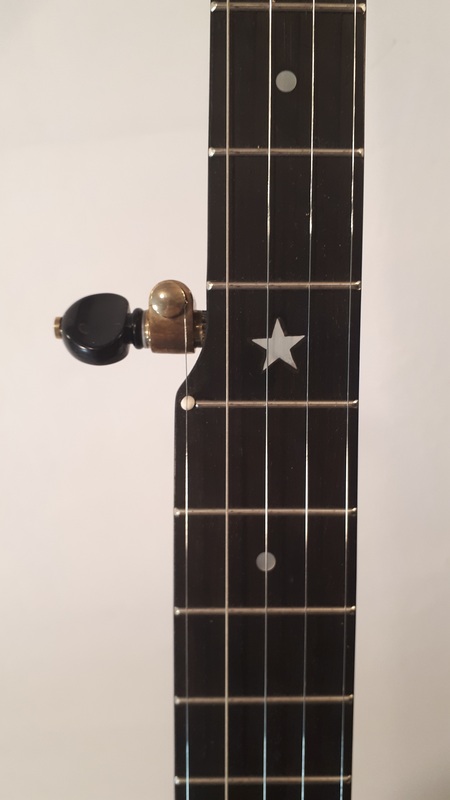 The Ebony fingerboard with the nice mother of pearl stars and dots look like it was never played. The action is easy with a 5/8 inch moon bridge. I am not certain if the calfskin is the original or a replacement from long time ago. 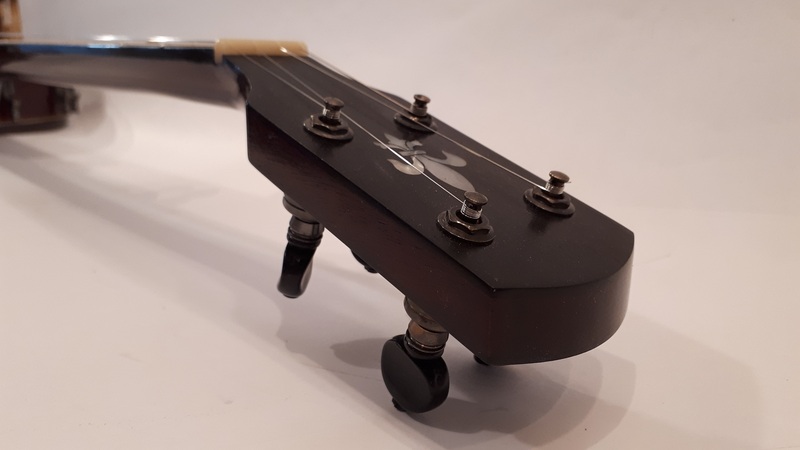 The original nickel plated brass tuners with pot metal buttons are in excellent condition and hold the tension correctly. 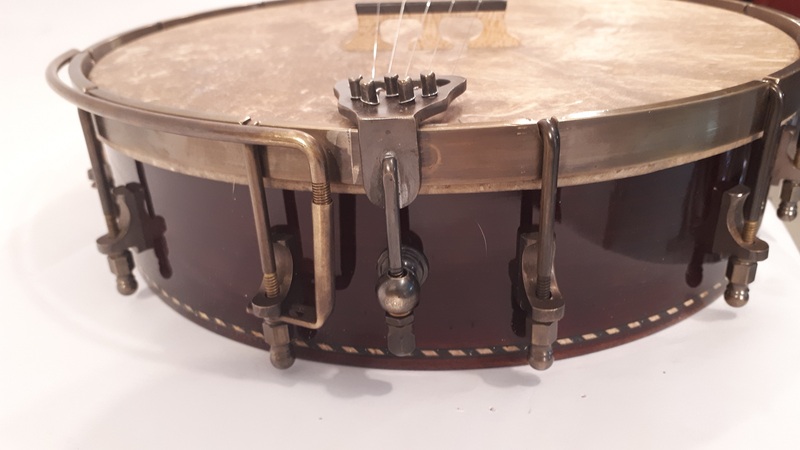 The banjo is strung with Nylgut strings but I can change them at no charge for ultra light steel strings if you prefer the steel strings sound. This very rare and beautiful banjo delivers a deep forth string and a great old time sound. Despite a few bruises and small scratches the banjo show no playing wear. Neck dimensions are 1 3/8 inch at the nut and 2 inches at the heel. Scale is 27 inches. Weight is 6,5 pounds. Plated Second Life Banjo No. 1201-4 restored by Carl Arcand in January 2014. MORE BANJOS COMING SOON. PLEASE KEEP VISITING.